An exciting new planner set has been released from Moleskine; the Volant Daily Planner Set. It offers one-page-per-day planning in thin, convenient monthly volumes along with a hard cover case for storage. The Moleskine Volant Daily Planner Set is composed of 12 thin daily planners and comes with its own slipcase. The first thing you will notice about the Volant Daily Planners is color, and lots of it. 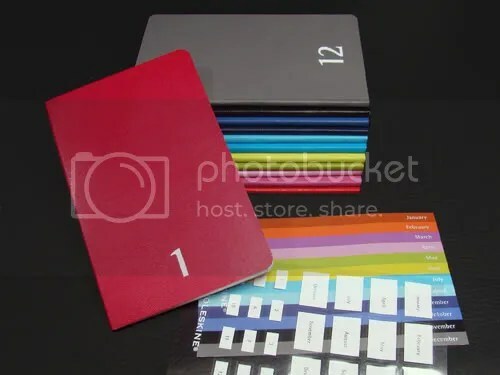 Each of the 12 monthly planners has its own color and number. When the volumes are stacked together in order, the set displays a rainbow of colors including reds, pinks greens, blues, black and gray. If you are familiar with Moleskine’s Volant notebooks, you will find some of the same colors in this set. The greens, blues, pinks and black are the same in addition to a few additional colors that look smart and are easy to organize. There are white labels for each month printed on clear plastic which correspond with the numbers printed on the bottom of each front cover. You can apply these as you see fit, but these would be most useful if applied on the spine so you identify the planners. Each month has a different color and number. I love this concept. Daily planners tend to be thick and cumbersome, but these little planners are thin and measure just 3/16″ making them ideal to tuck away in a purse or pocket. 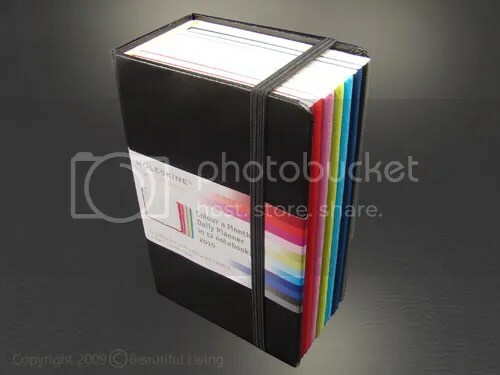 Each planner is so thin, that you might forget that you have it. 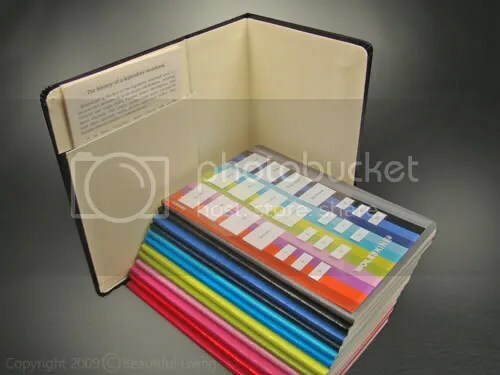 These would be an excellent choice for students who are already carrying around a mass of books and don’t want to add a heavy planner or agenda. You can just slip one into your pocket and you’re ready to go. If you already carry a small lined or plain Moleskine journal, this will take virtually no additional room. 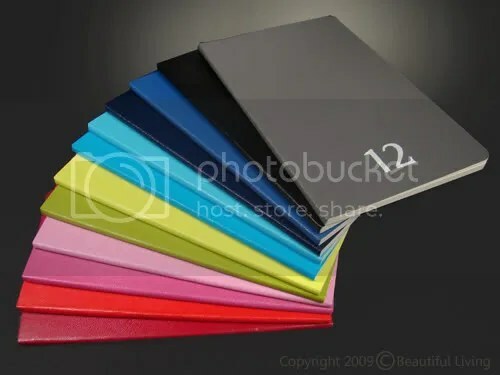 Because the planners have the same outer dimensions as the journals, you can slip one under the elastic strap of your notebook for a colorful addition that is attractive and functional. Each Moleskine Color a Day Set includes 12 daily planners and labels for customizing and a hard, protective case. The planners differ from the traditional black Moleskine planners primarily in the cover materials and design. Styled like the Volant notebooks, they feature thin, colorful, oilcloth covers but they lack the elastic strap that you will find on the classic planners. The covers come in the standard black and red in addition to 10 additional colors. The inside of the Volant Daily Planners have the exact same planning pages as the standard daily planner, one day per page. You’ll also find the same acid-free paper and great Italian design as the rest of Moleskine’s product line. If you like the styling and colors of Moleskine Volants and prefer a daily planner, you are going to love this set! The Moleskine Volant Daily Planner Set is available at www.journalingarts.com. The hard case has an elastic strap and expandable envelope. Moleskine’s 18 Month Planners are Now in Stock at www.JournalingArts.com! Moleskine’s 2009-2010 18 Month Planners are now in stock at www.journalingarts.com. These weekly planners are dated from July 1, 2009 through December 31, 2010 and are perfect for students and teachers. Choose from hard and soft cover versions in both red and black covers. You can save 10% now through June 30, 2009 by entering coupon code SAVE10NOW in the Discount Code box at checkout in the shopping cart. 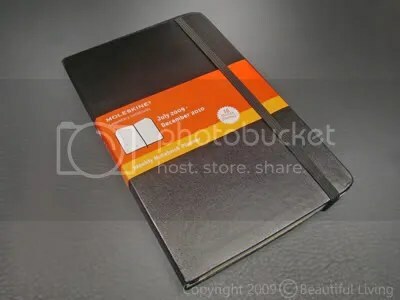 Moleskine's Large 18 Month Weekly Planner is in stock at http://www.journalingarts.com.